A generally useful tool for a variety of garden chores like weeding, cultivating, making holes for planting, splitting flats of seedlings, cutting garden line, plastic mulch etc. Heavy steel blade with semi-sharp beveled edges, hardwood handle, overall length 10" This is a multi-purpose gardening shear and is one of our best buys. The Shear is made of high carbon steel and is very, very sharp. It’s 8" long and designed to get good leverage for easiest cutting. The bows are cushioned for comfort. Use the Shear indoors, outside in any kind of garden, the greenhouse, the potting shed. Great for flower arrangers, tops for the Bonsai crowd. If you're involved in horticulture at all, you will want the GardenCut Shear. Some call these topiary shears. They are a handy size and sharp, sharp, sharp. These classic shears are 12" long overall with 6½" inch blades. Carbon steel and easy double bow action. This size is excellent for precise cutting and good for smaller hands, too. Slice through foliage easily. Good for any garden trimming and topiary. Made in Japan. The potting knife makes the job of separating the roots from the pot easier, and we have discovered many other jobs. The stainless steel blade has serrated teeth and is flexible! Slide the blade down the inside edge of the pot and work the roots free. Then use the flexible blade to shear and shape the root ball. Especially designed for orchids, but is appropriate for all other potted plants. Great for flower window boxes and planters of all sizes. The blade is 7½" long and 1¼" wide tapering to ½" and rounded at the tip. Overall length is 15½". A quality tool made in Japan. Felco 300 Harvesting Shear is a new Harvesting Shear from Felco. Lighter weight then other Felco pruners, yet strong. Use for flower and herb gatherering. Made in Italy for Felco. A Shear Delight. A useful tool in the garden. Cuts through roots and sod easily. Very, very sharp and serrated blade. Comes with a plastic snap on cover for safety when not in use or in storage. Curved for comfort. This is a great tool made in Japan. Our Dutch Garden Knife is a versatile multi-purpose garden tool. 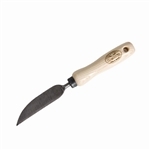 This garden knife is useful to cut weeds and roots and is handy to dig out small rocks. Can be useful as a bulb planter or mini trowel. It's lightweight and easy to maneuver in tight spaces and has a great wooden handle. This knife comes to us from Holland. The head / blade is 4" long by 1" wide. The total length is 8" and weighs about half a pound. These gardener’s scissors are universal scissors and can be described as Bonsai scissors, flower snips and Chinese Spear Scissors. Whatever you want to call them, they are extremely sharp and useful. For the garden, kitchen or potting shed these wonderfully designed gardener’s metal scissors are comfortable to use and very effective. From the UK. About 4 inches long. A Swiss Chopper made in Holland. Use to chop and clear brush. A large 11.8" blade with a total length of 17". Leather hand grip. Strong and durable.